Most people around are the world wonder where is Kilimanjaro? Mount Kilimanjaro is the highest free-standing mountain in the world, that is, it’s not part of a mountain range. Located approximately 200 miles south of the Equator in Tanzania, East Africa. Formerly Tanganyika, part of German East Africa during colonial times. One of the Seven Summits, Mount Kilimanjaro stands at 19,341ft, 5895m above sea level at it’s highest point, Uhuru Peak, the highest point on the crater rim. Formed at the same time as the Great Rift Valley, (around 750,000 years ago), Mount Kilimanjaro is one of the largest volcanoes in the world. A stratovolcano – otherwise known as a composite volcano – made up of layers of lava, ash and tephra (the material that falls back after an eruption). Comprising three volcanic peaks: Kibo (the one we climb), Mawenzi (a technical climb) and Shira. Kibo is classified as a dormant volcano, both Mawenzi and Shira are extinct. Mount Kilimanjaro towers above the Kilimanjaro National Park, a UNESCO World Heritage Site of approximately 75,000 hectares. The National Park was established in 1973 and at that time only comprised the area above the tree-line, with wildlife corridors through the forest. In 2005, the National Park was extended to include not only the area above the tree-line, but the entire montane forest on Kilimanjaro’s lower slopes. Now you know where is Kilimanjaro below we have explained on how to get there. Where do the Mount Kilimanjaro Climbs Begin? Your Mount Kilimanjaro adventure begins upon arrival to Kilimanjaro International Airport (JRO), which serves as the gateway to Arusha and Moshi, the two cities where most treks and safaris begin. International flights on KLM take place on an almost daily basis, making it easy for travelers from the U.S. and Europe to book passage to the country, although the time required to reach your destination can be quite long depending on your departure city. Most KLM flights arrive in the evening, with travelers immediately transferring to hotels for some much needed rest prior to the start of their trek. It is highly recommended that you arrive a day or two before you begin your hike up Kilimanjaro as that will give you some time to recover from the long days of travel. This will help maximize your chances of success on the mountain by ensuring you’re well rested before the Kilimanjaro climb. 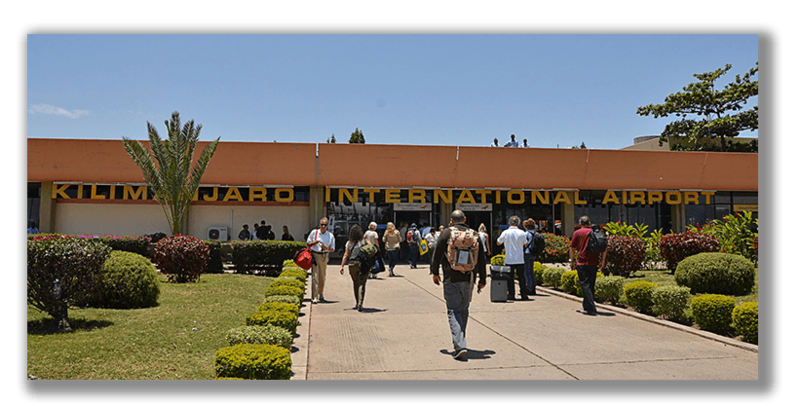 International travelers can also arrive via Jomo Kenyatta International Airport (NBO) in Nairobi, Kenya or Dar es Salaam International Airport (DAR) in the Tanzanian capital. But, both of those options have some additional caveats to consider before doing so. For instance, travelers who come through Kenya are required to buy an extra visa, and no matter which of these two airports you pass through, you’ll most likely need an overnight stay at that destination, and a long bus ride to reach the starting point of the their trek. When arriving in Tanzania, please allow some extra time to reach your lodging for the night. Moshi is about a 40 minute drive from Kilimanjaro International Airport and Arusha is about 90 minutes away. Taxis, buses, and private transfers are available at the airport. We are here to help you plan every phase of your trek. Please contact us if you have any questions or need any assistance for booking your flights, transferring to and from the airport, and booking your stay.